Polivoks is the portable electronic musical synthesizer which is designed for playing different musical compositions of any genre. 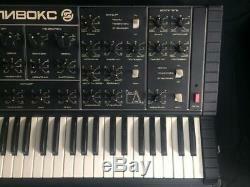 It is also intended for creating some musical effects in cinema and play scoring, in studio. There are 4 octaves on the keyboard. The inclined desk is divided into the following functional sections: Modulator, Generator #1, Generator #2, Mixer and Amplifier. They give one a possibility to synthesize a broad spectrum of sounds and to change sounding at any time. There are 3 internal audible signal sources in the instrument: to broad-ranged of the Generators with changed form of oscillations and a noise generator for creating a non-musical sounds such as wind, surf, whine, etc. Possibility to connect an external audible signal sources to the synthesizer is provided for e. Sounds of different external sources are combined separatly in the mixer in any ratio. 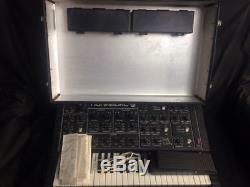 There is a filter in the synthesizer with cutoff frequency control and resonance to change colour of timbre of audilble signal over a wide range. 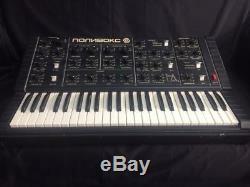 Duophonic analog synthesizer, with a 49-note keyboard. It features two VCOs, a noise generator, one LFO, a filter (low-pass and bandpass), and two ADSR envelope generators. VCO1 can be cross-modulated by VCO2. Each ADSR can be switched to auto-trigger, each with independent rates. The sound is quite rich and somewhat harsh and aggressive. This is more of a space-synth. You can be sure that you will have never heard the sounds this one can produce. 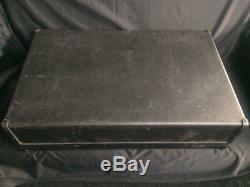 The supply voltage - 220-230V/50Hz. For use with 110/127V, a voltage converter is necessary. POLIVOKS has 5-DIN output and 1/4 Jack headphone output connections. 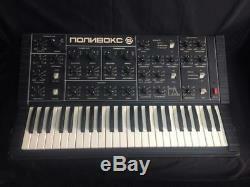 Weight of synth only - 23.00 kg (WITH packing). If the tool length will exceed 105 cm (41.3), I'll be forced to sever the neck and deck for dispatch. We try to do all the best for our buyers. If you: have any Questions, would like additional Pictures, have a special order, or would like more information. 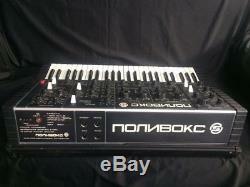 The item "POLIVOKS POLYVOX RARE Soviet Vintage ANALOG SYNTHESIZER USSR Russian" is in sale since Friday, August 3, 2018. 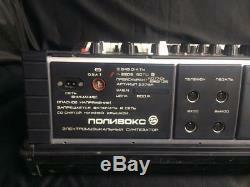 This item is in the category "Musical Instruments & Gear\Pro Audio Equipment\Synthesizers". 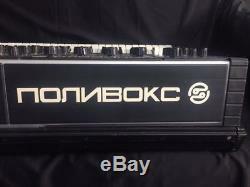 The seller is "soviet-vintage-musical-instruments" and is located in Minsk. This item can be shipped worldwide.